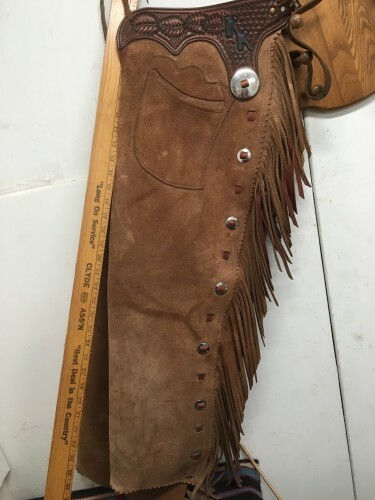 Very lightly used pair of chaps made by noted maker Ron Clark. They are unmarked, but he custom made these for the person we got them from. I was told that he gets close to a $1000 to make a pair. This pair has no issues, 38" length from top to bottom of outside, 27" upper thigh, waist adjusting from 32" to 47", two pockets, fringes, step ins w/brass zippers, tooled belt. Great pair of quality leather. We pay shipping within the 48 states and accept most forms of payment.